Julius Caesar may have crossed the Rubicon, but Julius Caeser crossed the Atlantic Ocean. That’s Julius Caeser Newman, better known as J.C. Newman, the founder of the oldest family-owned cigar company in America. After emigrating from Austria-Hungary in the late nineteenth century, he began his illustrious career in that most prestigious of cities: Cleveland, Ohio, and in the most auspicious of locations — his barn. From those humble circumstances one of the world’s best known cigar brands would emerge: Dr. Nickols 5 Cent cigar. Not to mention Student Prince. The cigar business is a transitory one. Perhaps this is due to the nature of the product, which when properly used is set alight and reduced to ashes. Looking at my “Cigar Diary” from a decade ago it is hard to find any brand still in existence, and most of the companies who made those cigars are history as well. But the Newman family has persevered in the business for over a hundred years, and that is no mean feat. 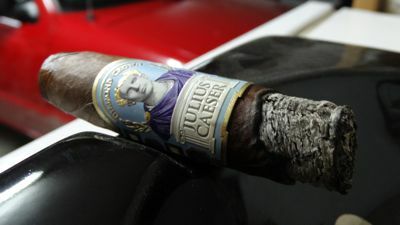 As a super premium cigar from the Tabacalera A. Fuente factory, the Julius Caeser can be expected to both look and perform in an exemplary manner, and the cigar does not fail on either front. The Ecuadorian Habano wrapper isn’t as creamy or seamless as Ecuadorian Connecticut, but with its perfectly rolled head and slight box press it is certainly presentable. The only minor flaw is some stray mucilage on the wrapper. At around $18 a cigar, this should not be there. The pyramid arrives with a slight box press. The roll has some give to it, but it takes a light quite readily and burns evenly. The draw is just right, and if you’re after long ashes, you’ll find this one hard to beat. 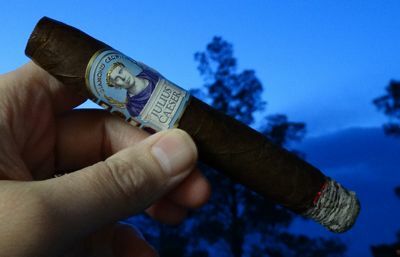 The Julius Caeser is a medium-bodied cigar that forgoes strength for complexity. The aroma is complex from the start — it’s woody with a touch of mint, almost approximating Cameroon, but softer. The flavor on the palate is earthy with an aftertaste of roasted nuts, and just a tingle of spice on the tongue. 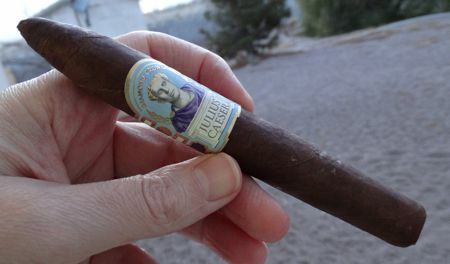 As the ash grows the cigar adds a dose of coffee bean, and at the mid-point gets almost musky. The aroma gradually gets sweeter, losing the minty note and replacing it with maple syrup and a mildly floral scent. The cigar loses some of its nuance in the final stage, but it stays cool to the end and never gets harsh or ashy. With its gentle demeanor and sophisticated aroma, this pyramid is extremely easy to smoke. The Julius Caeser pyramid is similar in many ways to the Diamond Crown Maximus pyramid. It shares its fine construction qualities, its sophistication and, unfortunately, its price tag. The robusto can be picked up for the bargain basement price of $11 USD, and you can add a couple bucks for each larger size. I almost put this one back when I found out it would set me back 18 bucks, but I’m glad I didn’t. It’s a luxury to enjoy on special occasions… like breakfast. If you’re Carlos Slim.